John Wolseley works on part of the monumental Distant glimpses ... at his studio. A visit to the studio of artist John Wolseley was a welcome opportunity to see an important work of art under construction and to gain a deeper understanding of methods, materials and possible preservation issues. It was also a chance to soak up the atmosphere as Wolseley explained how he created the monumental mixed media work on paper for the Museum’s Miḏawarr │Harvest exhibition. 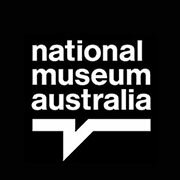 Midawarr explores the plants of north-east Arnhem Land through works by Wolseley and Yolŋu elder Mulkuṉ Wirrpanda. Wolseley’s 2 x 10 metre Distant glimpses of the great floodplain seen through a veil of trees and hanging vines is central to the exhibition. This work is extremely atmospheric as a whole but the viewer can also get lost in the delicate detail throughout. This is a work made up of many parts that combine to create a richly textured image of trees, landscape, foliage and insects. It incorporates heavy and very delicate papers, with robust and very fine techniques used to create the overall effect. The main body of the work is made up of three panels which hang side by side for display. The panels are constructed from irregularly cut overlapping sheets of heavy — around 300 grams per square metre — watercolour papers that have been glued together. In some areas, Wolseley has carefully cut the paper at the edges to mask areas below or follow contours of images, such as leaf edges. On the reverse, heavy paper pieces have been adhered as patch repairs, or as patches to join larger components. Fragments of discarded drawings have been used for repairs. The artist also added relief prints, rubbings taken from plant and timber surfaces, and one etching on fine (around 10gsm) Japanese paper. Distant glimpses ... detail. The beetle image was printed on very fine paper and adhered to the surface. The leaves are a mix of drawing and nature printing. The two horizontal lines at the top are registration marks to help line up the panels where the paper meets. Cylindrical magnets hold the work in place. Wolseley used a range of media to draw, paint, print, smudge, abrade and scratch to create the complex final image. He spoke of only using colours with good lightfastness qualities, which are less prone to fading. Much of the image is watercolour, including some pearlescent and luminescent colours. Pencils were used for line work, and are heavily smudged in areas to create shading and tone. The fine detail of some of the plants has been retained through ‘nature printing’, where leaves coated in oil paint or watercolour were combined with a papermaker’s formation aid fluid to create direct transfer images from plants. He has used other unusual techniques such as pressing crumpled cling film against wet paint to create unique textures. In contrast to much of the very fine work, but consistent with the precision in evidence, Wolseley has used a small rotary tool to abrade the paper surface and create clean, sharp edges around painted areas, leaving some of the paper broken or very thin. 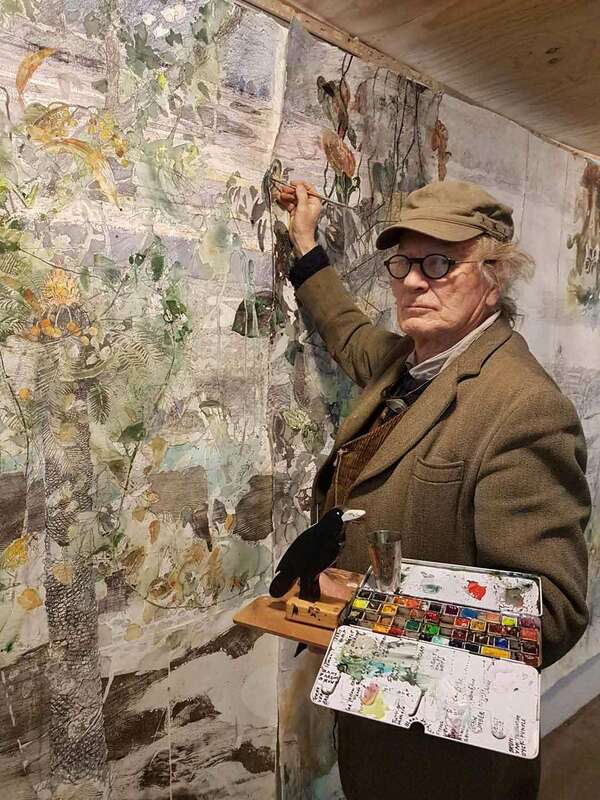 The visit to John Wolseley’s studio was a welcome opportunity to observe the artist at work and learn more about an artwork that is now part of the Museum’s collection.